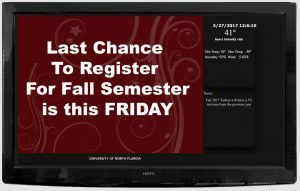 Discover Video has made it very easy for you to create unlimited custom digital signage displays. While other systems require you to learn new proprietary signage authoring tools, we have created a simple add-in for PowerPoint. Just about everyone knows how to use PowerPoint. Whether you are an expert with animations and transitions or just getting started, PowerPoint is used everywhere. Even Google Slides seems familiar because it looks and acts like PowerPoint, and you can export Google Slides as a PowerPoint file. 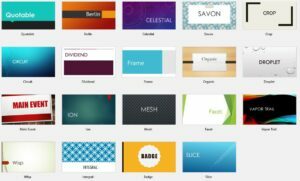 PowerPoint has a ton of built-in templates and it’s easy to create your own. There are hundreds of fonts, colors and a huge library of royalty-free clip-art. Animations are built-in. Transitions between slides is built-in and easy to use. And you can insert full motion HD video clips in your PowerPoint. You can record narrations, include audio, and you can record your own display time for each slide when you run a show. Imagine you create a PowerPoint for daily news and announcements. Maybe the first slide is “Welcome,” followed by today’s schedule, news and updates, lunch menu, and the tip of the day. You spend a lot of time making it perfect: cool animations and slide transitions give it that professional “pop” to get the attention of your audience. 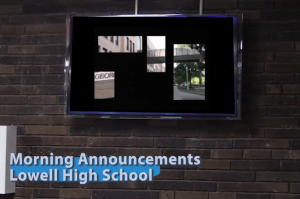 You publish it to your DEVOS system and it is now playing on your SignStick Digital Signage displays. Tomorrow you open the same PowerPoint and just edit a few things. Maybe a new lunch menu. Maybe a new tip of the day. The edit only takes you a few minutes. When you publish it, all the displays change with your update. No logging in to the system. No adjustment of playlists. No drama. One click update. The PowerPoint Add-in is free for Discover Video customers and you can click this link to download it right here and now. We even have a few simple PowerPoint templates for you. You can also do a quick web search and find hundreds of free PowerPoint templates. Simply install, enter some one-time settings, and you are good to go. The Add-in converts your PowerPoint to video and uploads it to your system with a single click! Use your new video anywhere you would use any video. Put your PowerPoint video in a playlist all by itself or along with other live or VoD content. Mix it up with live TV feeds and web pages. Issue a Priority Alert to interrupt your signage at any time. And of course you can update your PowerPoint content with a single click. The PowerPoint Add-in converts your PowerPoint to video and uploads it automatically. While this is great for digital signage, it is also a great way to produce tutorial content too. You will find many uses, now that it is one-click easy to do. Most of us are used to having Internet access anywhere and anytime. Some of us even seem to have withdrawal symptoms when out of WiFi or cellular range! When connected, we can stream live video from our smartphones to social media services as long as there is enough uplink bandwidth. Using Facebook, YouTube, and other apps, live streaming is pretty simple. Using the free Streamsie for iOS, we can stream or record to DEVOS, Arcus, and other services. But cellphone cameras are not ideal for more professional events, and when you want to use multiple fixed cameras. For more sophisticated streaming, you can use software on your computer such as Streamsie or OBS. Of course, the computer must have adequate Internet access to send the stream. Streaming from your laptop allows you to bring in HDMI, SDI, DVI, Composite and other audio/video sources via USB adapters. To get a computer to access the Internet via cellular, you can pair it with your smartphone. Or you can pair it with a stand-alone cellular “hotspot”. But the bandwidth you get is only what the one cellular connection can provide. For many use cases, this is enough. If you have a good connection and LTE service, your uplink bandwidth can exceed 1 Mbps. You might even get 3 Mbps or more. But you might not. And worse, you might get variable uplink speed where it can burst to higher speeds but only provides reliable uplink speed under 1 Mbps. 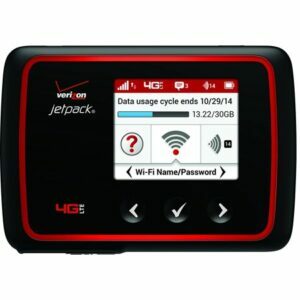 Using a consumer-class cellular hotspot presents other challenges. 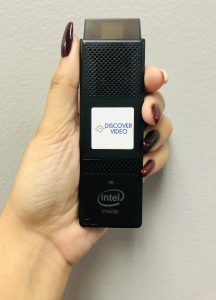 You will likely want to monitor your broadcast too, and connecting another computer to the cellular connection will consume even more of the limited bandwidth. To be clear, you can be completely successful using such a setup. In fact, we do it all the time. But out of practical necessity, the streaming rate used must be limited, typically under 1 Mbps. To provide a decent quality, you will want to reduce the resolution and lower the frame rate. This is often just fine for “talking head” video streaming. But what about higher quality streaming via cellular? You know that multiple cellular connections are possible: just look anywhere there are two or more people! Chances are they are looking down at their cellphones. Each smartphone has their own account and each is independently and simultaneously sending and receiving data. Imagine if you had multiple cellular accounts and you could spread you data across each one. Rather then sending data packets on one cellular connection, you could send packet 1 on cell 1, packet 2 on cell 2, packet 3 on cell 3, packet 4 on cell 4, and so on. Of course, you would need to somehow mark the packets so that they could be reassembled in the right order. But now the amount of data needed to be sent on each cell is reduced, and the total data sent and received is increased. It is more complex than this, but you get the idea. If you could send 1 Mbps on one cellular connection, you can send 2 Mbps on two connections, and 4 Mbps on four connections. This is called “bonding” and was first popular for ISDN landline connections. Today it is a great way to provide high-speed streaming over cellular connections. We recently tested Mushroom Networks Portabella bonding system with Spider. The bonding system had four Verizon cellular connections, pre-configured by the factory. A quick speed test showed about 5 Mbps of Internet access. Spider was configured to push five streams. 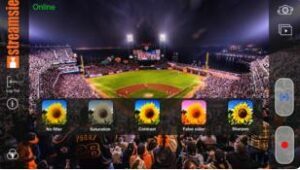 One stream for each of the four video inputs, plus one stream for the “Program” which is the processed output showing each input and picture-in-picture effects. Simply plug-in the Ethernet and Spider gets an IP address. Pushing the stream button on Spider started the streams. The result was flawless live video with no noticeable difference between streaming via landline or cellular. All live streaming solutions, whether hardware encoders like Mantis and Spider, software encoders like Streamsie, or 360 cameras like Insta360, perform best at high streaming rates. Mobile streaming, whether actually moving (like reporting weather from a moving car) or from a fixed location, is easy to do. With bonding, higher speed, higher resolution, HD and 4K video is available virtually anywhere, anytime. Cellular bonding eliminates the drama of over-subscribed local WiFi networks, and in some cases may be more reliable than fixed wired connections. And in cases where it absolutely must not fail, it’s good to know bonded cellular is there for you. Streaming does not have to be the “one to many” model. 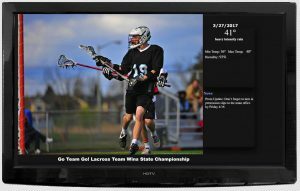 Playing the stream on one computer, or on one Set Top Box, is a great way to provide a simple and cost effective remote-to-studio feed where the output of the Set Top Box is the local soruce of the live remote video feed. What does “Multi-Stream” mean to you? Multi-stream could mean the ability to simultaneously stream live video to Facebook, YouTube, Twitch, Twitter, and your private viewing page. When you have a live event and want wide distribution, this kind of multi-stream is a great way to reach multiple audiences. Multi-stream is included in Arcus streaming service and is built-in to the DEVOS and DVExpress enterprise platform. 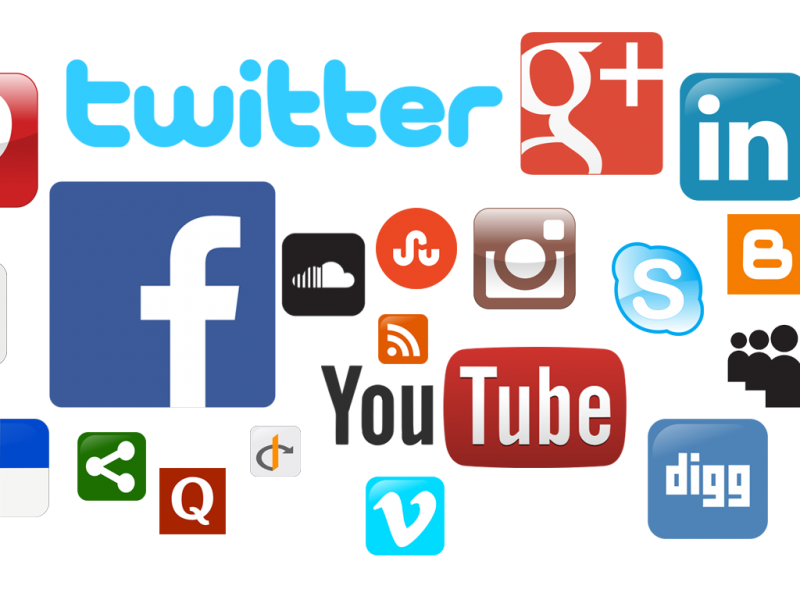 Streaming to multiple social media services makes it easy to reach your friends and subscribers, and costs nothing. Because it is done for you by the DiscoverVideo system, you don’t need multiple encoders or excessive uplink bandwidth. 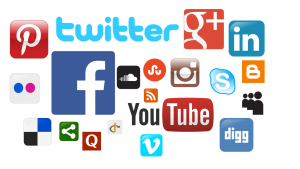 The DiscoverVideo system pushes your stream to your selected social media sites. With Arcus, your stream can also be distributed via your own custom player page, or embedded in any web page. And you can even monitized you media, sell “tickets” to view your event, accept donations, and more. 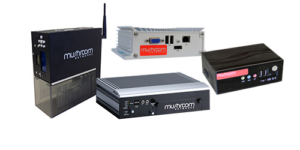 Multi-stream could mean the viewing of multiple streams simultaneously. We are not talking about a single player showing a split screen, or a quad view (you can do that too). No, we are talking about showing one, two, three, or four live streams simultanteously where the viewer can move them around and resize them on-the-fly. You would expect the videos to be related, such as multiple camera angles of a special event, but they don’t have to be. Popular uses for this type of multi-streams include lecture capture (as illustrated) where the viewer can decide what video they wish to view large or small. 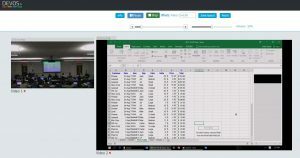 When viewing recorded lectures, the videos remain in sync and the student can easily navigate the set that might include video of the instructor, the instructor’s computer, document camera, and wide angle view of the classroom. Multi-Stream is also at the center of skills assessment configurations. Capturing multiple videos of students demonstrating clincial skills and reviewing the video in after-action reviews provides valuable learning experiences. Skills assessment is similar to lecture capture and uses multi-stream video to not only capture and record, but to empower teams to learn from the live video experience and to provide live feedback to the learners. Viewing live or on-demand multi-view video supported in browsers, of course, but is even supported in the free DiscoverVideo iOS app. For the more technically-minded, “multi-stream” could mean streaming the same content at multiple bit rates and resolutions. ABR, especially for live video, is particularlly useful for mobile viewers where bandwidth may be highly variable. The DiscoverVideo DEVOS system supports live transcoding of live video into mutliple rates and resolutions. Multi-stream could mean an encoder that can produce multiple streams. 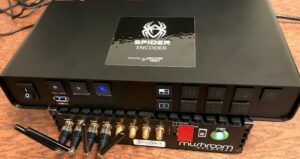 Consider Spider, which can produce up to 10 streams: two for each of the four independent live audio/video inputs, and two for a production program that consists of one or more of the video inputs. However you choose to think about “multi-stream”, DiscoverVideo supports it all. That’s good to know as your needs change and evolve. Not sure? Give us a call and we’re more than happy to answer any questions. I remember debating which protocol would dominate networking. Would IBM embrace IP over their SNA and Token Ring? Was Netware, then the dominate network system, going to support IP? Was Banyan Vines going to become more popular outside of certain government networks? Would ATM make the WAN and LAN distinction irrelevant? When IBM selected IP, the die was cast. And when the Internet became public, 25 years ago on April 30, 1993, the protocol debate was settled. In 1993 no one thought the 4 billion possible IP addresses would be exhausted in their lifetime. The early pioneers snatched up millions of addresses just for their own use because they could, and no one really seemed to worry, there were billions of unused addresses. IP addresses themselves did not cause a goldrush. With the evolving use of subnets and lower cost routers, one public IP address could be used to support a network of 10’s of thousands of users. So there was not a lot of worry about running out of addresses, even though work was proceeding on the next generation, IPV5 and IPV6. But as the Internet exploded, so did the IP address use. By 2010, only about 10% of the addresses remained. And by 2016, we were pretty much out. No new addresses could be assigned. That is, an organization such as your ISP could not get any more to assign to you. They had to make due with the block of IP addresses they had already been assigned. The initial Internet vision of every host having it’s own IP address became impossible with IPV4. With the Interent of Things, mobile devices, OTT streaming video players, tablets, and even vacum cleaners, toys, and toasters, IP addresses are in demand and there simply are not enough to go around, In fact, there are no more. Well, there are some more but they are second-hand. 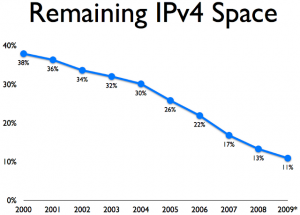 Harvesting unsued addresses from large organizations (MIT, IBM,and other early Internet pioneers), and carefully reusing existing inventory has allowed the IPV4 addresses to continue. But we are coming to the end and we’ve know it for a long time. That’s why there is the IPV6 address space. 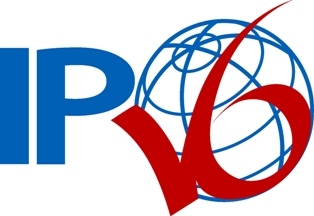 At a recent Connecticut Educational Technology commission meeting, we talked about IPV6 migration. Basically, we’re out of IPV4 addresses for the Connecticut Education Network (CEN), where I’ve played a role since its inception. And we are teaching network users how to migrate to IPV6. IPV6 (IPV5 existed but never materialized) provides more address space than there are grains of sand in the desert. In fact there are 2 to the 128th power (340,282,366,920,938,463,463,374,607,431,768,211,456) IPV6 addresses. That’s 340 undecillion addresses. If you could scan a million addresses per second, it would take about three times the age of the universe to hit them all. And of course, all of my network gear has to know how to work with IPV6. As I write this, my ISP (Comcast) has provisioned my router with an IPV6 address. It never needs to change, so I will never need “DyDNS” or similar tools. My DNS provider supports IPV6 so any domain I own can be reached with an IPV6 address. Windows and Linux both support IPV6. And we’ll be adding IPV6 support to the Discover Video appliances soon. Maybe you are already using IPv6 at home but didn’t realize it. If you are not already using it, brush up on IPV6. It’s not difficult. As its name implies, SignStick® is a small “stick” form-factor device that plugs directly into any modern TV or monitor to display digital signage. The SignStick connects to your network via WiFi or via the included Ethernet adapter. You configure the SignStick with a server address and the code for a Digital Sign. The SignStick then displays your sigange, which you control from the server. The server may be a DEVOS or DVExpress system on your premises or in the Cloud. Or your server may be the inexpensive Arcus service. So you simply create a playlist of your content, select a template, and your signage is ready. You can change your playlist and templates at any time and the SignSticks will automatically update to your new settings. Many customers love to use Google Slides for part of their Signage strategy. Google Slides is very much like traditional PowerPoint, but it is purely online. You can modify your slides at any time from anywhere, and the changes are reflected in your Digital Signage display without futher action. Mix your Google Slides with live and on-demand video, images, and web pages in the system “Mix” template and you can have any layout you wish. Each SignStick displays the signage based on the code you entered. All SignSticks can have the same code, or they can all be different. The system places no limits on the number of variety of signs you may create. Show the lunch menu in the cafeteria while others are showing your welcome or news signs. SignStick supports time-of-day scheduling, so you can show one sign in the morning, another at noon, another in the afternoon, and another in the evening. Whenever you wish, you can cause one, some, or all your signs to change to display an emergency video, text, or web page. 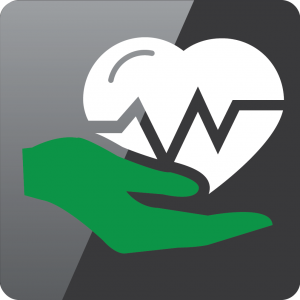 Or use Priority Alert to display breaking news or live ‘Morning Announcements” at any time. You can even use Priority Alert to announce transportation schedule (“Bus 1 is ready now”). While DEVOS also allow you to display Digtial Signage in a web browser, I think you will agree a browser is not ideal for reliable operation. Running any broswer 7 x 24 with or without Adobe Flash is a problem, and eventually it will crash. 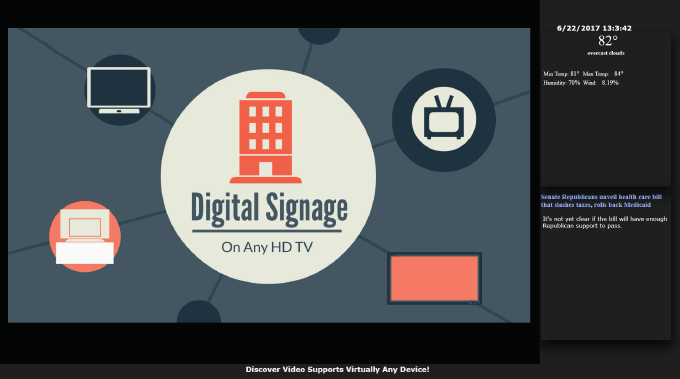 SignStick plays your Digital Signage content directly without depending on browsers for display of video or images. SignStick automatically caches your Video and Images and intelligently manages storage. The first cycle through your playlist, the content is played via streaming from the server. But all subsequent playouts are from cache, unless you change somethng. Live video is of course, live and not cached. This arrangment means minimum bandwidth usage. Plus, signs continue to play even without a network connection!